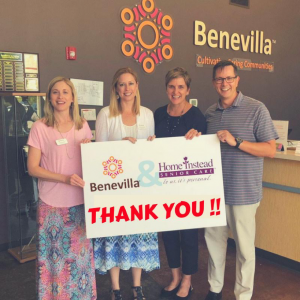 West Valley, Arizona – Benevilla, the West Valley’s premier human services non-profit says Thank You to everyone who supported us during the “GIVE65” online fundraising event. This enterprise, benefiting the senior population in our community is a program of the Home Instead Senior Care Foundation. Benevilla raised at total of $6,875 – $4,410 from online fundraising donations and another $2,465 in matching funds. The senior population is rapidly increasing, yet, the pace of government and philanthropic support for seniors is not. Often times, public funding for services and programs that benefit seniors is the first affected by funding cuts. At Benevilla, we know this all too well. Our services and programs are in high demand with the growing senior population, and we rely heavily on the generous support of the community to continue to provide the programs and services that empower seniors to remain independent and to age with dignity. From July 10 to 12, Benevilla received donations of $4,410 in the third-annual “GIVE65” event, a 65-hour online fundraising event to help nonprofit organizations serving seniors raise money online and increase awareness. An added benefit of their participation in this partnership was the possible matching dollars awarded by the Home Instead Senior Care Foundation. Benevilla has cause to celebrate as it was announced they would be awarded $2,465 in matching funds. This was made possible by all of the generous contributors that supported Benevilla during this event! This event is an initiative of the Home Instead Senior Care Foundation® and the nation’s first and only crowd-fundraising platform focused on helping nonprofit organizations across the country raise funds specifically for programs and services benefiting seniors. More than 120 senior-focused nonprofits from across the United States participated. Home Instead Senior Care Foundation is proud to present GIVE65 – the first crowd-fundraising platform exclusively devoted to helping nonprofits raise funds online for programs and services that create hope for seniors. At GIVE65.org, senior-focused nonprofits in the United States are invited to showcase projects that are helping seniors and those who care for them. People who have a desire to help less fortunate, vulnerable seniors can visit GIVE65.org to share a secure, online donation in support of the featured nonprofit they choose. By combining technology and generosity, GIVE65 inspires greater charitable giving in support of seniors and those who care for them. Visit www.GIVE65.org to learn more. Since its founding in 2003, Home Instead Senior Care Foundation has been helping less fortunate and vulnerable seniors. The Foundation has invested nearly $3 million in nonprofit organizations serving seniors in the United States. The mission of the Foundation is to enhance the lives of aging adults and those who care for them. This mission is made possible, in part, thanks to Home Instead, Inc., as well as generous sponsors and donations from the general public. To learn more about the Foundation, visit www.homeinsteadseniorcarefoundation.org.